There are reports that the government is contemplating a Rs. 50,000 crore stimulus to boost the economy. The notion that governments need to stimulate aggregate demand when the economy slows down was first proposed by economist John Keynes in the 1930’s. This Keynesian approach to fighting economic downturns by increasing government spending has been tried unsuccessfully in the US, Japan, and many European Union countries and is unlikely to work in India. Attempts by the government to spend its way out of economic downturns fail because it ignores the important question: Where does the government get the money for spending? If it prints new money it creates inflation and robs people of their purchasing power; if it increases taxes it takes capital that would otherwise be employed more gainfully by the private sector, and if it borrows money it crowds out private investment from access to capital and creates debt for future generations. 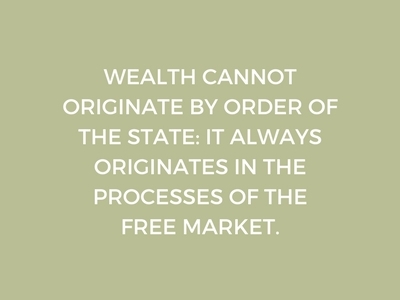 Economic history teaches us that growth comes from ideas, innovations, institutions, and attitudes all juxtaposed on a set of fair laws that protect private property and intellectual capital. America’s greatness as an economic power is the result of a business culture that nourishes innovation, individualism, and entrepreneurship, along with an abiding respect for the rule of law. India’s own experience from the liberalization of 1991 suggests that reducing the role of government in matters of economics and commerce and incentivizing private sector investment is the key to economic growth. So what should the government do instead? It should first recognize that economic growth is created by the private sector. Then it should understand that there are ONLY two ways to increase growth: either by increasing the number of people working in the production process or raising productivity through investment-led growth in innovative technologies. This can only be achieved through policies that increase private sector activity. In order, therefore, to get this economy moving again the government has to create an environment to increase private sector activity. Reduce corporate tax to 10%. Cutting tax rates stimulates the economy which in turn increases revenue collection. Research shows that when tax rates are reduced tax revenues increase and inversely when rates are raised government revenue falls. Ronald Reagan’s 1983 tax cuts in the US led to a doubling of economic growth and significantly higher tax revenues for the Treasury. Eliminate the capital gains tax. This tax is a huge impediment to capital turnover and abolishing it will release billions in locked up capital. Simplify GST with a single tax rate across all products and services and quarterly filing of returns. Raise capital by selling the government’s share in public sector companies. The existing market value of all 240 or so Public Sector Companies is about Rs. 19 Lakh crores. Plus trillions of rupees are locked in real estate assets owned by government undertakings. This value can be unlocked and invested in infrastructure, education and skill development. The elephant in the room is India’s banking crisis. Currently, 14% of all loans granted by public banks are bad loans, and this number is likely to get worse. This is a huge drag on private investment. The government should initiate the privatization of all banking in India.The days of inefficiently run state-run banks are over. Develop a vibrant corporate bond market as an alternative source of funding for the private sector. Currently, 80% of private investment capital is provided by the banks. Competition from the bond market will bring market discipline to interest rates and allows companies with good business models but weak collaterals to get capital for their growth. Remove all capital account restrictions on the rupee and make it fully convertible. This, along with the elimination of capital gains tax, will enhance liquidity in India’s capital markets and attract significant foreign capital. Order all government agencies to slash in half regulations that are crippling businesses. This will reassure the private sector that the government is serious about reform. Minimize attempts at coercive tax collection. This will only end up further demoralizing businesses. The informal sector consists of thousands of small businesses run by people who are either unemployed or not employable. They play a very useful role in circulating capital within an ecosystem and providing employment to millions. This maintains social order. Any attempts to forcibly formalize this sector will cause social and economic disruption.